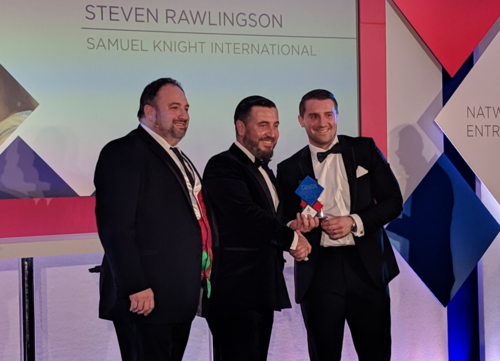 Global recruitment and project manpower provider, specialising in the energy and rail sectors, Samuel Knight International, has been awarded Team of the Year in the Great British Entrepreneur Awards. Sponsored by NatWest, the awards were held in five cities including Birmingham, Manchester, Cardiff, Edinburgh and London. The winners for the Great British Entrepreneur awards in Manchester, were announced yesterday evening (15th November) at the Old Trafford. Now in their 6th year, the awards have a long-standing history of celebrating the best of British business and championing the stories of entrepreneurs who have later gone on to become household names. The NatWest Great British Entrepreneur Awards acknowledge the hard work and truly inspiring stories of businesses in Great Britain who are the agents of positive change. Judges for the inaugural Entrepreneurs’ Team of the Year award recognised Samuel Knight for its tremendous team performance within the last four years. Transforming into a £16 million pound turnover company, increasing headcount from four to fifty employees and expanding from one to three offices with bases in Newcastle, London and Bristol. Samuel Knight International is a global recruitment and project man-power specialist, providing skills and project solutions to the energy and rail sectors on a permanent, contract and project basis. Samuel Knight’s impressive growth since its inception in 2014, is testimony to the unrivalled services, people and project solutions the company has provided to clients. With three UK offices and plans to soon expand internationally, Samuel Knight International is a fast-rising star in the recruitment world.